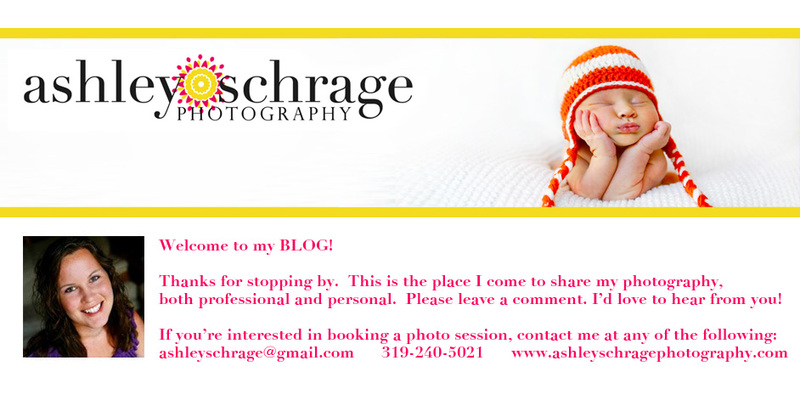 Ashley Schrage: 2010 is here! Changes are coming! I'm looking ahead to 2010! It's been an incredible year for me, and I couldn't have dreamed that this little photography business could have kept me so busy. I'm beyond grateful, and feel very blessed for everyone who has been part of my journey! I've received some constructive criticism that my 2009 prices were to low. I gave a lot, and for a very cheap price. But I was learning, and it was important for me to get my name out there and earn some clients that would keep coming back and refer me to their friends. I "tested" out a lot of things this past year, and I'm excited to use everything I learned to give better photographs this coming year. 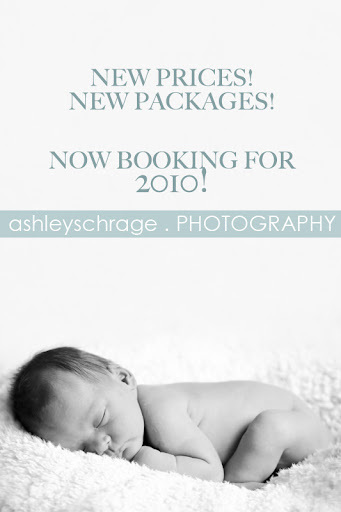 I have raised my prices for 2010 and am now offering packages instead of a flat fee for a CD. The first and BEST change in the packages for 2010 is that ALL sessions will get an online gallery and YOU get to choose how many images you receive on your CD. Through LOTS of time learning, I have gotten much better at editing photos and love to use everything I've learned on each photo I give. Now that YOU choose the photos, I will be able to take the extra time to make your favorites just perfect. I have learned that there is no reason to spend a little time on 60 images, but to spend a lot of time on the ones you really love! I'm also giving each package a print credit. It sounds simple, but makes so much sense. I only use a professional print lab to print photos for the highest quality. I want people to know what their photos SHOULD look like when printed. I've seen my photos look pretty cruddy because they were printed at a bad lab, and I want to make sure you can have at least a few prints in hand to see what they are supposed to look like. Some of the packages also include Gallery Wraps, Christmas Cards, and a hardcover book. Please send me an email if you are interested in hearing all the details of the new packages. I have been able to begin using my 2010 prices for sessions that were booked in November and I have been thrilled with the outcome. I'm really excited for the new year and to help you get your images OFF your computer and on your walls! YAY! can't wait to see some of your new stuff!